The TI-5040 introduced in 1976 was one of the best selling printing desktop calculators. This TI-5040 II carries a famous name but the real successor of the TI-5040 could be found with the TI-5142. The printed circuit board (PCB) of this TI-5040 II manufactured in December 1982 is centered around a Mitsubishi M58856 single-chip solution for printing calculators. 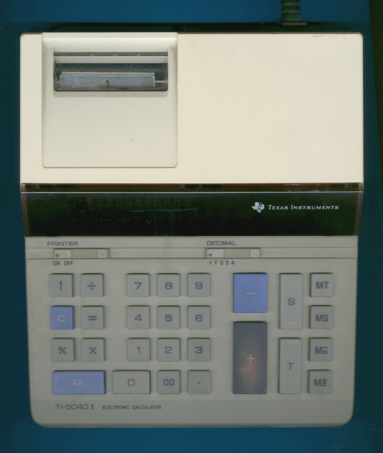 The design of the TI-5040 II was changed slightly in 1983, please notice the position of the TI-logo. The TI-5040 II is featured in the Texas Instruments Incorporated leaflet CL-199M dated 1983.